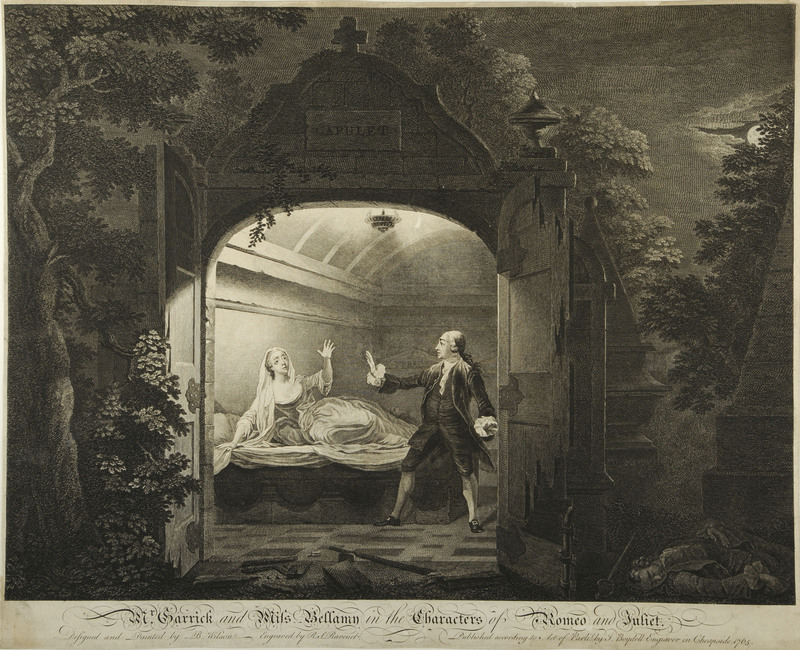 To continue with Garrick, and his extraordinary influence on the understanding of Shakespeare in English popular culture: below, this engraving of Benjamin Wilson’s 1751-52 painting, Mr. Garrick and Miss Bellamy in the characters of Romeo and Juliet, joins the ranks of beloved items not included in the Remembering Shakespeare exhibition. Benjamin Wilson, Mr. Garrick and Miss Bellamy in the characters of Romeo and Juliet ([London]: by John Boydell, 1765). From the collections of the Lewis Walpole Library, Yale University. The painting marks the colorful history of Romeo and Juliet on the eighteenth-centry London stage. The play had been revived for the London theatre by Theophilus Cibber in 1744, casting his daughter, Jenny, as Juliet. In 1748-49, Garrick produced the play at the Drury Lane Theatre, casting Mrs. Cibber (Theophilus Cibbers’s estranged second wife) as Juliet, with the actor Spranger Barry as Romeo. Greatly acclaimed, the production collapsed when Garrick lost his Juliet to a dispute over pay; his Romeo refused to play with a substitute, and Cibber and Barry together took their production to the Covent Garden Theatre for the 1750-51 season. When Garrick cast himself as Romeo and George Anne Bellamy as Juliet for a production at the Drury Lane Theatre, London saw a short-lived but exciting season of duelling Romeo and Juliets. The engraving, shown above, is part of the extensive eighteenth-century print collections of Yale’s Lewis Walpole Library, and was gently coveted by the co-curator for the Remembering Shakespeare exhibition, where it would have accompanied the 1599 annotated edition of Romeo and Juliet on loan from Yale’s Elizabethan Club. As fortune has it, the engraving is shown to even better effect in the Lewis Walpole Library’s current exhibition on Garrick and Shakespeare, curated by Margaret K. Powell, W. S. Lewis Librarian and Executive Director, and Joseph Roach, Sterling Professor of Theater and English at Yale. Here the engraving forms part of a series exploring Garrick as Shakespearean actor, and revealing his revolutionary fluidity and range of expression on the English stage.